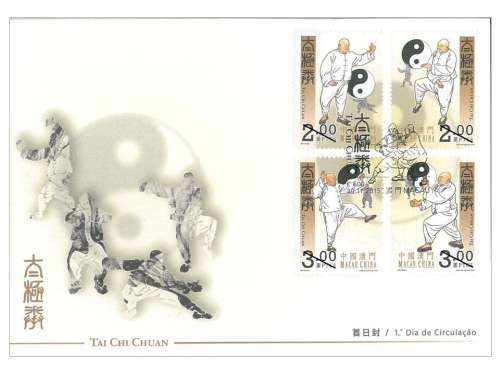 STAMP ISSUE "TAI CHI CHUAN"
Tai Chi Chuan is considered as a gem of Chinese martial arts, and one of the most popular sports in China. 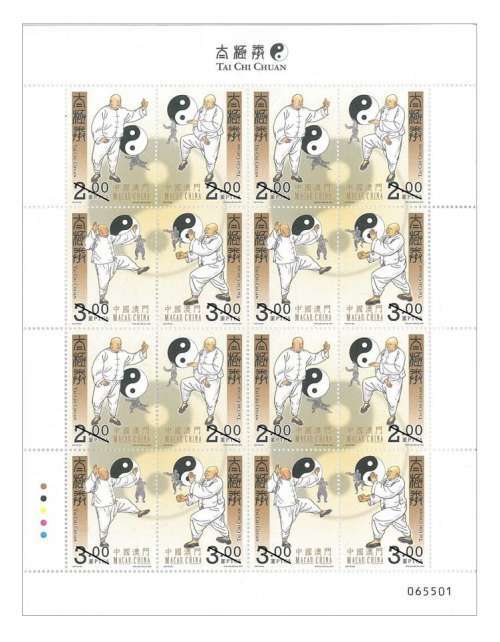 Macao Post will issue the stamp theme “Tai Chi Kuan” on 30th November, 2015. 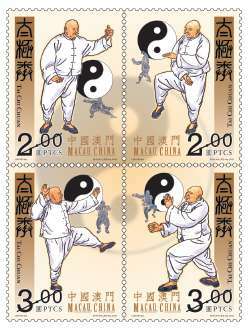 This issue includes a set of four stamps, illustrating the framework of Tai Chi Chuan movements, namely: “Wave Hands Like Clouds – Left Style”, “Wild Horse Mane – Right Style”, “Separation of Left Foot” and “Fist under Elbow Punch”. No matter which style or branch, Tai Chi Chuan is diversified yet it follows the original principles: Suspending the head without tension and lifting the inner strength, to enable one’s internal energy to sink into lower abdominal. Relaxing the breast and stretching out the back; dropping the shoulders and sinking the elbows. Loosening the waist and dropping in the hip; centring of tailbone. Both upper and lower part works in harmony, with the use of mental mind but not exertion, as if the moving clouds and flowing water. Starting from the feet, developing through the leg, dominating at the waist, and expressing through the fingers. 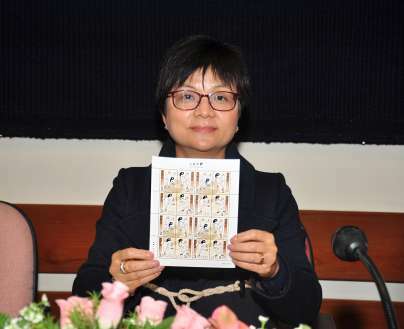 The stamp designer of this issue is Mr. Lok Hei, and the text of the information brochure is written by Mr. Lok Pó. This is the fifteenth theme in 2015. 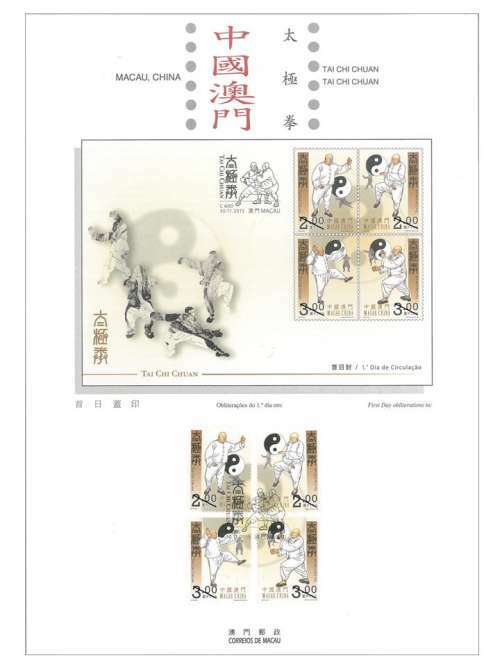 The previous issued stamps are “Lunar Year of the Goat” on 05/01/2015, the label stamp “Lunar Year of the Goat” on 28/01/2015, “110th Anniversary of Rotary International” on 16/02/2015, “Mainland Scenery VI” on 01/03/2015, “25 Years of AICEP” on 27/04/2015, “Macao Wetlands” on 05/05/2015, “110th Anniversary of the Birth of Xian Xinghai” on 13/06/2015, the label stamp “Old Streets and Alleys” on 30/06/2015, “150th Anniversary of Guia Lighthouse” on 08/07/2015, “10th Anniversary of the Historic Centre of Macao as World Heritage” on 15/07/2015, “Water and Life” on 31/07/2015, “70th Anniversary of Victory in the Chinese People’s War of Resistance Against Japan” on 03/09/2015, the definitive stamps “Old Streets and Alleys” on 22/09/2015, “Festivity” on 09/10/2015, “Literature and its Characters – Jiu Ge” on 30/10/2015, and “Science and Technology – Magic Squares II” on 12/11/2015. 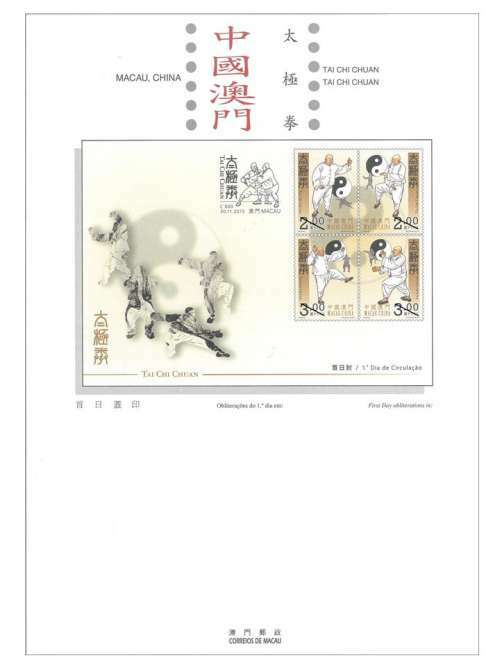 Technical Data of Stamp "TAI CHI CHUAN"